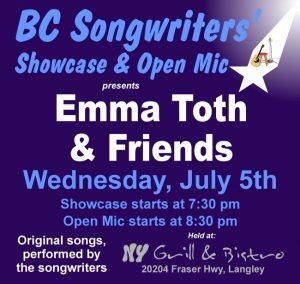 On Wednesday, July 5th, the Songwriter Showcase features Emma Toth & Friends, starting at 7:30 pm. Open Mic follows at 8:30 pm. 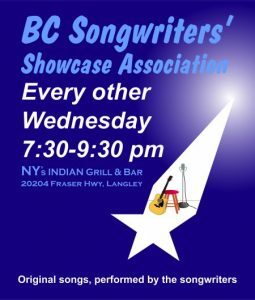 BC Songwriter Showcase & Open Mic performances are held at NY Grill & Bistro – 20204 Fraser Hwy, Langley.